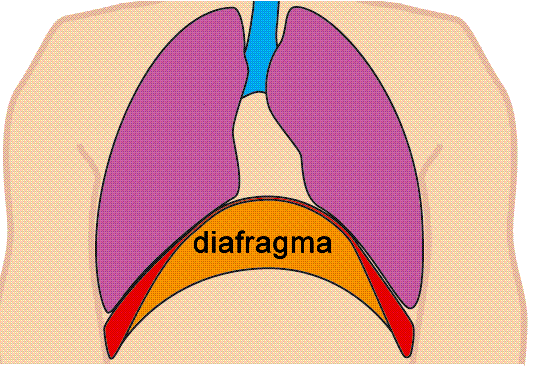 The diaphragm is the only muscle fully transverse to the body. It has a great complexity both structurally and physiological level. This muscle parts of parts of muscle tissue and connective tissue, and part of the human body in two. For example, so that food reaches the stomach has to pass through the diaphragm to which it is no more openings through which pass large veins and arteries, the esophagus to the stomach, etc.,… whereby if the diaphragm is tense or blocked all these functions are limited. But the main function of the diaphragm is breathing, dome shape inserted into the base of our ribcage. When we breathe down to make room for the air entering the lungs when we breathe ups and bellows while returns the space to the viscera. Usually tends to gasp for problems of anxiety and stress, that make breathing becomes more rapid and tense and, ultimately, they will blocking. Strong emotions also cause spasms, the problem is that if the diaphragm is blocked by states of anxiety or emotionally upset these feed back by the sensations produced locks, these sensations are choking, unable to breathe properly, anxiety, vomiting poor appetite or feeling in the mouth load stomach insomnia in some cases. First if too locked is better to go to a good therapist. Disciplines that are based on breathing and harmonization are very good because aside to help eliminate the problem also combat the causes. These are taichi, yoga and chi kung / qigong. – The deep, conscious breathing is the first way we relax the diaphragm, to learn how to do it is advisable to put a hand on his chest and one in the abdomen swell and feel as the inspiration and expiration are deflated in, it is advisable to keep a couple of seconds the period between inspiration and expiration. – We can also give us a massage using oil that can be added bergamot, lavender or some other relaxing. We clasped hands on the solar plexus (the end point of the sternum), and as we slid deep breaths hand with firm pressure and expiring point where we are forced to repeatedly. – From the same point during expiration we can make a deep pressure around the edge of the ribs. Both exercises can be performed at least three times. – Finally we can hold your hand over the chest and keep the tissue motion tracking and follow up focusing, or put your hands on both sides of the last ribs and follow the rhythm of breathing. To prevent our diaphragm to contract is best to try and breathe in case you need to practice relaxation techniques.